Wacker Polymers develops, manufactures, and distributes dispersions; as well as provides value-based solutions for a wide variety of customer needs. For our engineered fabrics customers, our globally available VINNAPAS® AND VINNOL® dispersions provide critical functionality and valued attributes such as excellent wet/dry strength, dimensional stability, solvent resistance, triggerable dispersibility, and soft hand in disposable applications such as wipes, towels, personal hygiene products, surgical packs and cover stock. Other dispersions offer stiffness and/or fire retardency for use in durable nonwovens for automotive and furniture applications; and for batting and filters. With technical center locations in the Americas, Europe and Asia; our experienced staff is ready to provide product and applications solutions anywhere on the globe. Wallner Expac Inc. takes pride in being the founder and leader in manufacturing of expanded metal material used in pleated filters. For over 40 years Web Industries has been a leader in the field of flexible material contract manufacturing. We have a long history of helping Fortune 500 companies roll out new products quickly and efficiently, and our integrated design and development services provide a smooth transition from rapid prototyping to commercial-scale production. Every day, consumers purchase innovative products in the health & beauty, home cleaning, and personal hygiene categories that features components that came off our production lines on time, in spec, and at budget. From basic converting to complete contract manufacturing, make Web Industries your partner for success. Wellmark is a Polypropylene recycler located in Central North Carolina. We recycle and compound 40+ million pounds annually of recycled polypropylene for internal use for injection molded parts. We have recently invested in equipment to convert nonwoven bales or rolls into a pelletized form that can be introduced back into a molding operation. Wellmark can also provide a Letter of Destruction for any rolled goods. Let us develop a recycling program for your company today. Drop trailers available. Top $$$ paid for clean rolls and bales. Welspun is proud to announce its entry into the Technical Textiles spaces. We begin our foray into this space with an entry in the nonwovens segment.|Like in other categories, Welspun aims to be leader in this space. We are planning to expand aggressively in this space. We will soon be entering categories. We have a strong team of professionals who are assisting us in this journey to leadership in technical textiles. |Our state-of-the-art spunlace roll goods manufacturing facility has been commissioned in March 2012 with a production capacity of 7,000 MT per annum. It is equipped with the latest nonwoven technology supplied by one of the most distinguished nonwovens technology supplier from Germany and is patented. |Our plant is in the process of extension of the ISO 9001:2008 and Social Accountability (SA-8000) certified and has various other certifications like the Oeko Tex standard 100 and Global Organic Textiles standard (GOTS). |As the technology suggests, our spunlace roll goods have the necessary softness, drape, conformability and high strength without addition of any chemicals. This makes it ideal for both baby and personal care and also for commercial uses. We also offer the flexibility in the fibres and blends for these goods. Manufacturer of wipe containers and closures. Barnet is a global supplier of synthetic fibers to the nonwovens industry. Barnet manufactures and distributes a wide variety of fibers that cover all nonwoven applications. Wm. T. Burnett & Co. offers a diverse and unique range of technical foam and nonwoven products for the automotive, bedding, filtration, furniture, industrial, thermoplastic, composite, and specialty markets. In business for over 100 years, the company has always been known for competitively priced high quality products, innovative technology and responsive customer service. Its products are component materials in the end-use products of some of the world's largest and best known manufacturers. It ships its products throughout North America and to other continents as well. 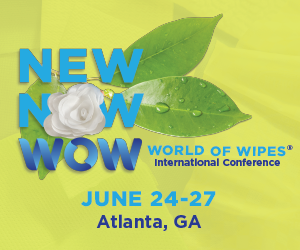 WPT Nonwovens offers a wide variety of quality American-made nonwoven fabric, including polyester, cotton, rayon, and blended nonwoven fabrics. We offer buyers a host of advantages as their nonwoven fabric supplier. Our advanced facility provides full capabilities to handle quick-change challenges, with the ability to develop and run new and innovative trials quickly and efficiently. We are able to affordably serve the needs of small quantity niche buyers as well as large quantity customers.